The Autumn Sunset was first discovered by New Hampshire rose grower and nurseryman Malcolm "Mike" Lowe in 1986. His company, Lowe's Roses, introduced this variety to the United States under the name Autumn Sunset shortly after. This gorgeous apricot colored rose is available in both a climbing variety and a shorter shrub rose, making it suitable for a wide variety of locations around your garden! Autumn Sunset climbing roses produce absolutely stunning blooms that are apricot colored the blend into a nice rich orange or golden yellow color at their centers. The blooms are of an average size, reaching about 3 inches in diameter with double blooms averaging 17 to 25 petals. 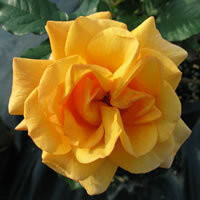 This variety blooms in clusters and if properly cared for will continue to bloom throughout the growing season. The shrub version of Autumn Sunset will grow up to about 6 feet tall while the climbing variety can reach heights up to 11 or 12 feet tall. 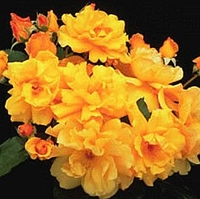 Back in the late 90's, Edmunds advertised Autumn Sunset climbing roses as the perfect rose for those East Coast and Midwest gardeners who have been looking for a yellow colored climbing rose that can survive the winter. These days we know of several yellow climbers that grow well in regions that experience the colder winters, but that is certainly no reason to look away from this golden beauty. While all your friends and neighbors are growing the traditional yellow roses, let them be green with envy when they see your Autumn Sunset explode with color. Autumn Sunset roses have a wide variety of uses throughout your garden because they are very trainable climbers and they even produce hips that are decorative. They have proven to be resilient against a wide variety of common diseases that afflict roses, making them a favorite among novice and experienced growers alike. Among the many possible uses for Autumn Sunset, you could train them to climb up the pillars of a porch, or add supports on either side of a doorway and create a golden rose framing. They would look great around a gazebo or climbing up an arbor or trellis. Virtually anything you can imagine. Planting your Autumn Sunset climbing roses is the same as planting just about any other type of rose. You either received your Autumn Sunset in a container or as a bareroot like most of us do, and the planting process only varies slightly depending on how you received it. If your rose is in a container, then you need to dig a hole that is larger than the container itself. Personally I like to double the size of the containers and I'll explain why here shortly. If you received your Autumn Sunset as a bareroot plant, then you need to dig a hole as deep and wide as the roots are long. The idea is to be able to set the plant with all the roots fanning outward naturally rather than curling them around the hole. Once you have the hole dug, mix the pile of freshly dug soil with some fresh organic compost, sold in bags at any local garden center. This is why you dug an oversize hole. Set your Autumn Sunset so the union bud is about an inch or two below the surface of the soil, then backfill halfway. Water the soil thoroughly so that all the roots get covered properly, then fill the hole the rest of the way and water it again. You might be asking yourself at this point why we planted the way that we did. The organic compost actually serves several purposes. First off, it adds basic nutrients to the existing soil without overdoing it completely. 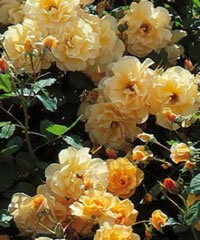 This will help to give your new Autumn Sunset climbing roses a good soil base in which to develop a strong root system. The first two seasons are the most important in the life of a new plant so getting it right is essential to healthy growth. 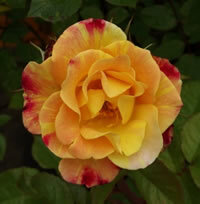 In addition, the compost will help retain a little moisture longer, allowing the rose to absorb it. Now roses in general need well-drained soil, but it's a fine balance between drainage and simply wasting nutrients that run off before the plant can use them. The other thing you want to do is lay down a nice layer of fresh mulch after planting your Autumn Sunset. Not only will it keep the soil cooler and also retain a little moisture, but it helps create a barrier between the foliage and the soil, where diseases and pests often lie in wait to splash up onto your rose. I often get asked when should you fertilize roses. I know what I've learned from my own experiences and I've read countless articles and How To's on this subject and I will tell you something I have discovered, but not read or heard ANYWHERE…if you ask 10 different growers how to fertilize roses, you are likely to get 10 different answers. Everyone has their own preferences and their own ideas of what works best for their roses, and you eventually will as well! As a general rule of thumb, most seem to agree on a good all-purpose granular fertilizer, many prefer organic. I have not had much luck myself with liquid chemical fertilizers and that seems to be somewhat common among other growers. I feed my roses 3x each year. The first time is in early spring as soon as I see the foliage start to sprout. I feed them again individually as each plant is just ready to begin its first bloom cycle. Then I follow up with one more about 4-6 weeks later, usually in mid July as I've found it helps promote better additional blooms than those without the third feeding. In moderation you really can learn a lot experimenting with different rose fertilizers until you develop your own schedule and system. 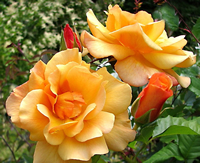 I hope this article gave you a lot of information on Autumn Sunset roses and be sure to check out some of our other pages for more great tips and insight.